Hi everyone! Welcome to Day 14 of our Glorious Autumn Block Party. Today we have Eleanor Burns as our featured designer and great savings from Flare Fabrics too. Did anyone else learn to quilt while watching Eleanor’s TV series and/or videos? I definitely learned a lot from her and was thrilled to see many videos available on her web site for everyone to enjoy and learn from. Be sure to check it out. Flare Fabrics is a Canadian online quilt store specializing in batiks and bold, modern, contemporary cottons. We offer a vibrant and dynamic selection of beautiful cottons to quilters looking for fabrics that ignite their creativity. We sell only the highest quality cotton in the market at the absolute best prices, and we offer FREE shipping everywhere in Canada! We also have patterns and kits to appeal to all tastes and experience. We are dedicated to providing great prices, great selection and great service. Buy 2 metres get 1 metre free! 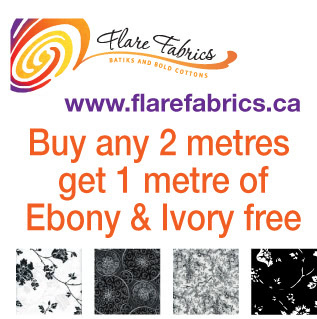 Purchase any two metres of fabric, and receive one free metre from the Ebony and Ivory Line! Buy any combination to equal two metres of fabric, and receive a free metre of Ebony and Ivory cotton. Just tell us which one (1) Ebony and Ivory fabric you want in the comments section at check out. Your chosen fabric will be included in your shipment. Offer valid until Sunday, Oct 14, 2012. I began sewing on a small, crank-handle toy sewing machine when I was a young child growing up in Pennsylvania. I remember looking for any available fabric and discovered my Aunt Edna’s chicken feed sacks, which provided me with hours of stitching time! By the age of thirteen, I polished my skills and was able to use my mom’s newly purchased green Elna sewing machine! As a young women, I received a Bachelor of Science degree in Education with a minor in Special Education from Edinboro State College. My graduate work at Penn State University was great preparation for me to become a quilt designer and teacher. I wrote curriculum for 6 years, and then began to teach quilting in 1978 after my local recreation department allowed me to host a class. I was teaching a Log Cabin Quilt and my students were asking me to write a book. Not many people were publishing books at the time, but I did it because my students wanted to share it with others, and I needed to support my family. 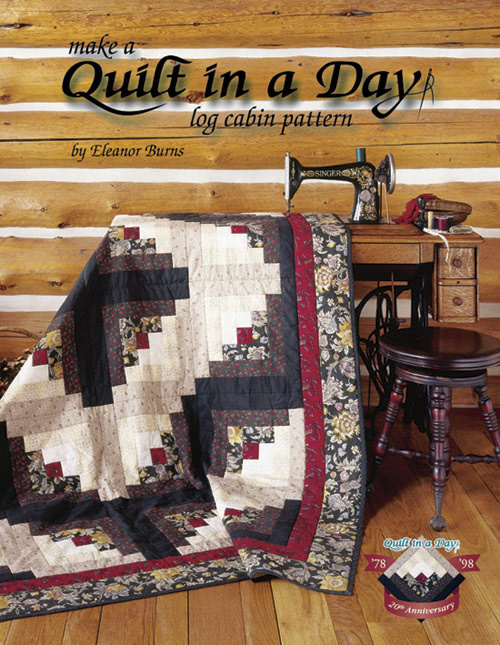 In 1978, I self-published my first book “Make a Quilt in a Day: Log Cabin Pattern”. Since then I have published over 120 additional Quilt in a Day books and patterns. After thirty-five years, I feel so very blessed that I can still share with others and make them as happy as it makes me. I’ve designed so many quilts and fabric projects – it is so hard to choose one. I really enjoy my newest quilt, Tales of First Ladies. The charming setting is taken from a quilt made in the 1800s. I used both antique settings and reproduction fabric for the quilt pictured. I taught the First Ladies quilt in 2011 to 90 local students and nearly 200 online students. Our time together was memorable! Learning a new block with unique techniques each month is always educational. Beyond that, we hungered to learn more about our First Ladies, and the tales we discovered were hilarious! How many UFOs do you currently have? Several! I’m currently trying to finish my new book, which I hope to release in April 2013. 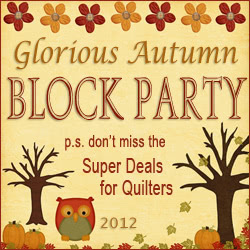 I have been hosting my 2012 Block Party – Quilts from El’s Kitchen. It is so much fun to create and share the new blocks that will be a part of my new book! What size of quilt do you prefer to make/design? I love making lap quilts! What colour do you use most often in your quilts? Red. Favourite one-sentence tip for a new quilter: Don’t be intimidated, everyone has to start somewhere! Here’s Eleanor’s block, Autumn at the White House. It’s an excellent block for using up scraps. 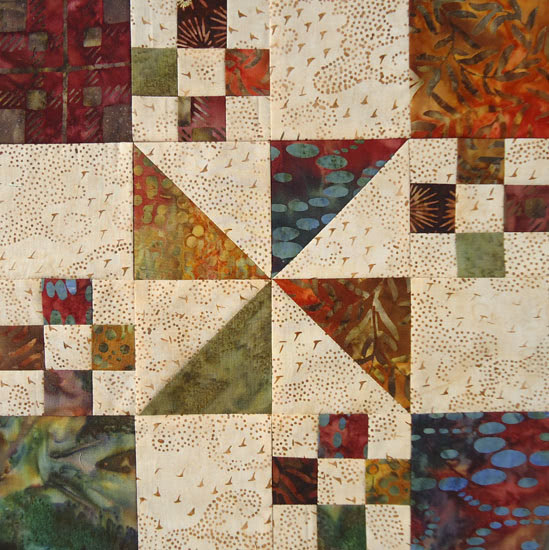 Eleanor has provided a great tutorial with lots of tips and quick piecing methods for putting this block together. Head over to the Quilt in a Day web site to download the free tutorial. You can also sign up to get the instructions for making this block into a scrappy lap quilt. View the other 13 Glorious Autumn blocks! I totally love this block. I love E.Burns way of sewing too. I love Eleanor Burns’ books. She makes it so easy to follow along. I usually tape her shows, too. That way if I have a questions about something in the book I can find it one of my tapes. Sometimes no matter how many times you read something, it just makes more sense when you actually see it done. Hi, I have made many of your quilts. The first was the log cabin. The last was the Tales of the First Ladies. Actually. I am making the second one of those and have made many log cabins. Also have made others from The Quilt in a Day books. I Love Eleanor Burns. She not only has the best techniques, the best instructions, she make me laugh. I love watching her block parties. I have watched her since the 80’s. I finally the last 2 years got the courage to try making the pieced quilts. She just makes it so easy. Especially those geese. Thank you El for everything. I don’t get you on tv anymore, but if I get stuck on something I go to your web site. Thank You. 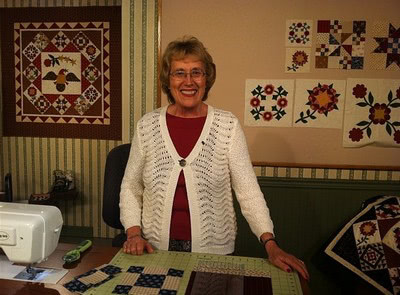 I’ve spent many hours in front of the TV watching Eleanor Burns make quilts. She is delightful! Love this block! I really love the batiks! It says there is an error and the block will not open when I try to download it. I would love to have the block pattern. Is anyone else having this issue?? 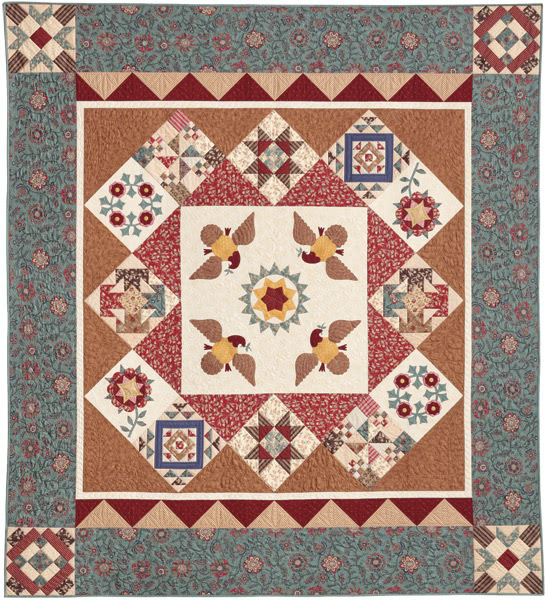 Beautiful block and one of the first quilts I made was with this book! Many, many years ago. I love this block too. Thank you for the nice interview. I’m a fan of Eleanor and her books. Eleanor, I took one of your very first Log Cabin quilt classes in Escondido before you got your store in San Marcos. I have made many of your quilts in years past. I love your way of making quilts. And I like how helpful you & Patricia have been to me in years past. Keep up the good work. I still have the first Quilt in a Day log cabin book. But I also have many of your other books. Now I live in Northern Calif. & miss going to your shop. And I’m thrilled you have a place in Julian. Julian was always the place I would go to when I felt “closed in”. I love the mountains & Autumn there. Happy quilting to you always. I’m an Eleanor Burns fan and love her books. I also enjoy it when her sister comes to our guild to show the quilts to her new book. Thanks for the pattern. Well El is the queen of quilting. I have all of her books ,taken about 8 classes from her and even went on a cruise with her. In my book she is the greatest. She is a beautiful person inside and out. A excellent teacher and the best she can make you laugh.